Canada Day Harinama - July 1st - 4pm ~ The Toronto Hare Krishna Temple! 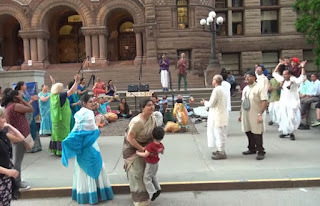 What can be a better way for devotees to celebrate Canada Day than going out on the annual Canada Day Harinama (outdoor chanting and dancing)? 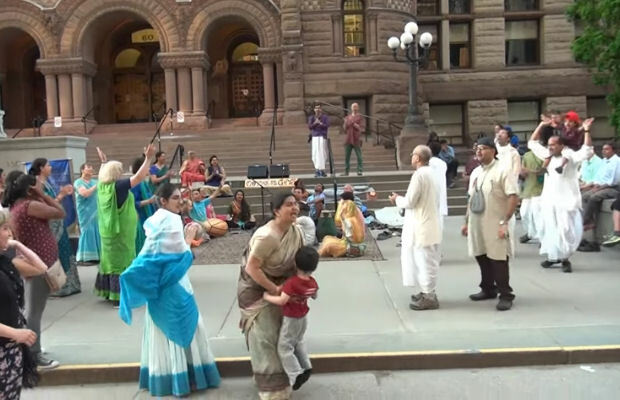 It has been our Hare Krishna tradition to celebrate Canada Day by hitting the streets with chanting and dancing! The main goal of this event is to invite as many people as possible to the upcoming RATHA-YATRA (FESTIVAL OF INDIA) by distributing cards! It will be an opportunity for us to create a buzz for the upcoming festival! Everyone is asked to meet at the temple at 4:00pm, especially for those who would like to get dressed up, have gopi-dots painted, tilak, etc. and then head out at 4:30pm. We will be doing a sit-down style harinama at Old City Hall, located on the northeast corner of Bay & Queen Streets! Please dress in the best vaishnava (devotional) attire so we can present Krishna Consciousness in the most beautiful way. Prasadam will be provided for all of devotees after we come back. - or just wave and smile at people!